The illustrations really capture the humor and hijinks of the story, enhancing it with nice wit and detail. Children will root for the clever pigs and laugh at the clueless farmers and townsfolk. 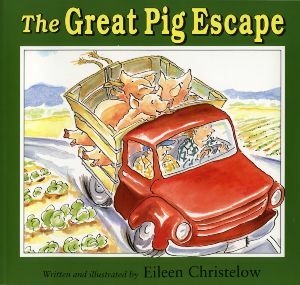 This is a lighthearted animal liberation story, with the pigs in charge of their own rescue. Great for reading aloud. That sounds like an adorable story; I look for it for my son’s 6th birthday. Sounds cute! I just logged on and picked up a used copy off eBay. Thanks for the review! I love the integrity of the pigs returning the clothing they stole to make their big escape (to Florida — as if they’re going on spring break!). It delivers a nice message to kids, and to all of us, that we shouldn’t do harm in order to do good, and if we do, we might want to go back and rectify it as best we can. Thanks for a great review! Wow, there are copies of this book available on paperbackswap.com. I’m getting one for my kiddo — but I can see there’s at least one more up for grabs. Thanks for the review! We got this for our daughter for Christmas and we all love it.